The mathematician Hermann Weyl who made many diverse contributions to his discipline once made the startling assertion that whenever he had to choose between truth and beauty in his works, he usually chose beauty. Mathematicians and theoretical physicists are finely attuned to the notion of beauty. They certainly have history on their side; some of the greatest equations of physics and theories of mathematics sparkle with economy, elegance and surprising universality, qualities which make them beautiful. Like Weyl, Paul Dirac was famously known to extol beauty in his creations and once said that there is no place in the world for ugly mathematics; the equation named after him is a testament to his faith in the harmony of things. How do you define and reconcile truth and beauty in chemistry? And is chemical truth chemical beauty? In chemistry the situation is trickier since chemistry much more than physics is an experimental science based on models rather than universal overarching theories. Chemists more than physicists revel in the details of their subject. Perhaps the succinct equations of thermodynamics come closest in chemistry to defining beauty, but physics can equally lay claim to these equations. Is there a quintessentially chemical notion of beauty and how does it relate to any definition of truth? Keats famously said, “Beauty is truth, truth beauty”. Is this true in chemistry? At this point it’s fruitful to compare any description of beauty in chemistry with that in science in general. Although scientific beauty can be notoriously subjective, many explanatory scientific frameworks deemed beautiful seem to share certain qualities. Foremost among these qualities are universality and economy; more specifically, the ability to explain the creation of complexity from simplicity. In physics for instance, the Dirac equation is considered a supreme example of beauty since in half a dozen symbols it essentially explains all the properties of the electron and also unifies it with the special theory of relativity. In mathematics, a proof – Euclid’s proof of the infinitude of prime numbers for instance – is thought to be beautiful if it combines the qualities of economy, generality and surprise. Beauty is inherent in biology too. Darwin’s theory of natural selection is considered to be especially elegant because just like equations in physics or theorems in mathematics, it explains an extraordinary diversity of phenomena using a principle which can be stated in a few simple words. It is not easy to find similar notions of beauty in chemistry, but if we look around carefully we do find examples, even if they may not sound as profound or universal as those in chemistry’s sister disciplines. Perhaps not surprisingly, many of these examples are most manifest in theories of chemical bonding, since these theories underlie all of chemistry in principle. I certainly saw elegance when I studied crystal field theory. Crystal field theory uses a few simple notions of the splitting of energies of molecular orbitals to explain the color, magnetic and electric properties of thousands of compounds. It’s not a quantitative framework and it’s not perfect, but it can be taught to a high school student and has ample qualitative explanatory power. Another minor chemical concept which impressed me with its sheer simplicity was VSEPR (Valence Shell Electron Pair Repulsion). VSEPR predicts the shape of simple molecules based on the number of their valence electrons. Working out the consequences for a molecule’s geometry using VSEPR is literally a back of the envelope exercise. It’s the kind of idea one may call “cute”, but in its own limited way it’s certainly elegant. Yet another paradigm from the field of bonding is Hückel theory. Hückel theory seeks to predict the orbital energies and properties of unsaturated molecules like ethylene and benzene. It will tell you for instance why tomatoes are red and what happens when a photon of light strikes your retina. Again, the theory is not as rigorous as some of the advanced methods that followed it, but for its simplicity it is both elegant and remarkable useful. As an aside, anyone who wants to get an idea of beauty in chemistry should read Linus Pauling’s landmark book “The Nature of the Chemical Bond”. The volume still stands as the ultimate example of how an untold variety of phenomena and molecular structures can be understood through the application of a few simple, elegant rules. The rules are derived through a combination of empirical data and rigorous quantum mechanics calculations. This fact may immediately lead purist physicists to denounce any inkling of beauty in chemistry, but they would be wrong. Chemistry is not applied physics, and its unique mix of empiricism and theory constitutes its own set of explanatory fundamental principles, in every way as foundational as the Dirac equation or Einstein’s field equations are to physics. This mention of the difference between empiricism and theory reminds me of a conversation I once had with a colleague that bears on our discussion of elegance and beauty in chemistry. We were arguing the merits of using molecular mechanics and quantum mechanics for calculating the properties of molecules. Molecular mechanics is a simple method that can give accurate results when parameterized using empirical experimental information. Quantum mechanics is a complicated method that gives rigorous, first-principle results without needing any parameterization. The question was, is quantum mechanics or molecular mechanics more “elegant”? Quantum mechanics does calculate everything from scratch and in principle is a perfect theory of chemistry, but for a truly rigorous and accurate calculation of a realistic molecular system, its equations can become complicated, unwieldy and can take up several pages. Molecular mechanics on the other hand can be represented using a few simple mathematical terms which can be scribbled on the back of a cocktail napkin. Unlike quantum mechanics, molecular mechanics calculations on well-parameterized molecules take a few minutes and can give results comparable in accuracy to those of its more rigorous counterpart. The method needs to be extensively parameterized of course, but one could argue that its simple representation makes it more “elegant” than quantum mechanics. In addition, on a practical basis one may not even need the accuracy of quantum mechanics for their research. Depending on the context and need, different degrees of accuracy may be sufficient for the chemical practitioner; for instance, calculation of relative energies may not be affected by a constant error in each of the calculations, but that of absolute energy will not tolerate such an error. The discussion makes it clear than, while definitions of elegance are beyond a point subjective and philosophical, in chemistry elegance can be defined as much by practical accessibility and convenience as by perfect theoretical frameworks and extreme rigor. In chemistry “truth” can be tantamount to “utility”. In this sense the chemist is akin to the carpenter who judges the “truth” of his chair based on whether someone can comfortably sit on it. While these expositions of beauty in theories of chemical bonding are abstract, there is a much starker and obvious manifestation of chemical pulchritude, in the marvelous little molecular machines that nature has exquisitely crafted through evolution. This is true of crystal structures in general but especially of protein structures. X-ray crystallographers who have cracked open the secrets of key proteins are all too aware of this beauty. Consider almost any structure of a protein deposited in the Protein Data Bank (PDB) – the world’s largest protein structure repository – and one immediately becomes aware of the sheer variety and awe-inspiring spatial disposition of nature’s building blocks. As someone who looks at protein and ligand structures for a living, I could spend days staring at the regularity and precise architecture of these entities. The structure of a profoundly important biochemical object like the ribosome is certainly pleasing to the eye, but more importantly, it contains very few superfluous elements and is composed of exactly the right number of constituent parts necessary for it to carry out its function. It is like a Mozart opera, containing only that which is necessary. In addition these structures often display elements of symmetry, always an important criterion for considerations of beauty in any field. Thus an elegant molecular structure in general and protein structure in particular straddles both the mathematician’s and biologist’s conception of beauty; it is a resounding example of economy and it resembles the biologist’s idea of geometric harmony as found in creatures like crustaceans and diatoms. The ensuing discussion may make it sound like chemistry lacks the pervasive beauty of grand explanatory theories and must relegate itself to limited displays of elegance and beauty through specific models. But chemistry also has trappings of beauty which have no counterpart in physics, mathematics or biology. This is most manifest through the drawing of molecular structures which are an inseparable part of the chemist’s everyday trade. These displays of penmanship put chemistry in the same league as the visual arts and architecture and impart to it a unique element of art which almost no other science can claim. They constitute acts of creation and not just appreciation of existing phenomena. What other kind of scientist spends most of his working day observing and manipulating lines, circles, polygons and their intersections? 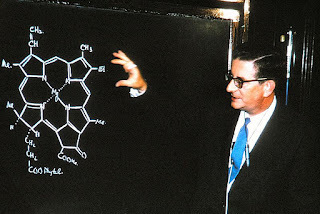 A Robert Burns Woodward who could fill up a whole blackboard with stunningly beautiful colored handrawn structures and make this chemical canvas the primary focus of his three-hour talk can exist only in chemistry. While contemplating these elegant structures, our original question arises again: is the beauty in these drawings the truth? What is astonishing in this case is that almost all the structures that chemists draw are purely convenient fictions! Consider the quintessential prototype aromatic hydrocarbon, benzene, drawn with its alternating double bonds. In reality there are no double bonds, not even dotted lines representing partial double bonds. All that exists is a fuzzy dance of electrons and nuclei which cannot be imagined, let alone drawn on paper. The same goes for every other molecule that we draw on paper in which one-dimensional geometric representations completely fail to live up to the task of corresponding to real entities. Like almost everything else in chemistry, these are models. And yet, think about how stupendously useful these models are. They have made their way into the textbooks of every budding student of chemistry and constitute the principal tools whereby chemists around the world turn the chaff of raw materials like hydrocarbons from crude oil into the gold of immensely useful products like pharmaceuticals, plastics and catalysts. The great physicist Eugene Wigner once wrote an influential article titled “The Unreasonable Effectiveness of Mathematics in the Natural Sciences”. Wigner was expressing awe at the uncanny correspondence between artificial squiggles of mathematical symbols on paper and the real fundamental building blocks of the natural world like elementary particles. Chemists need to express similar awe at the correspondence between their arrow pushing, molecular chairs and boats and the manifestation of these manipulations as the real solids, liquids and gases in their beakers. One kind of arrow pushing leads to the creation of a cancer drug, another kind leads to a better catalyst for petroleum refining. In this instance, the beauty of molecular structures quite spectacularly corresponds to the truth. “While in mathematics, presumably one's imagination may run riot without limit, in chemistry, one's ideas, however beautiful, logical, elegant, imaginative they may be in their own right, are simply without value unless they are actually applicable to the one physical environment we have- in short, they are only good if they work! I personally very much enjoy the very special challenge which this physical restraint on fantasy presents." The “physical restraint on fantasy” that Woodward talked about keeps every chemist from being seduced by beauty at the expense of truth. Beauty still reigns and is a guiding force for the chemist whenever he or she plans a synthesis, solves an x-ray structure, computes a molecular property or mixes together two simple chemicals with the expectation that they will form a wondrous, intricate lattice. But unlike Keats, the chemist knows that truth can be beauty but beauty may not be truth. 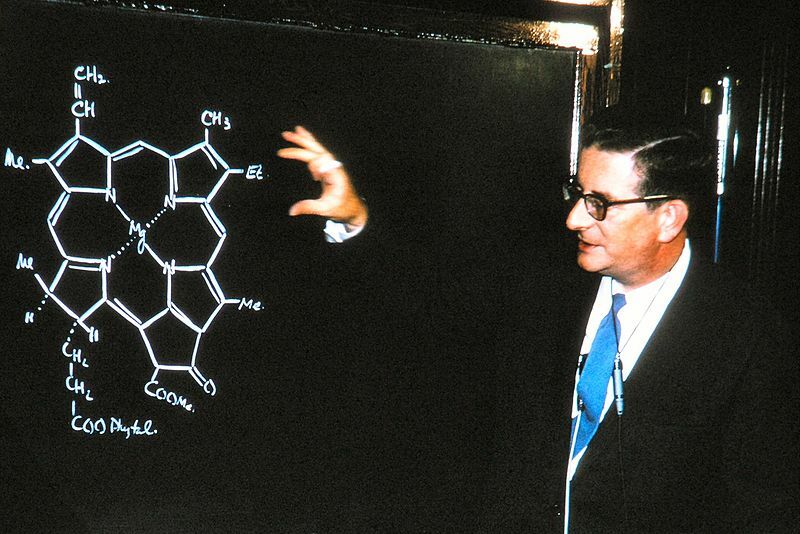 As Woodward quipped, “In chemistry, ideas have to answer to reality”. And reality tends to define beauty in its own terms. I have to be honest - I always get that faintly nauseous sensation in my gut when the issue of "beauty in science" is raised. It's quite subjective and - truth be told - it's something that evolves with time. What I found interesting and beautiful 10 years ago may not quite be the case nowadays, while what I thought was bland and unattractive has now taken on new life and perspective. I would also suspect that the messiness going from the very formal and succinct statements of theory to trying to solve actual physical problems is just as prevalent in physics as it is in chemistry. I mean, numerical relativity and computational condensed matter can chew up processing time without any difficulty, just as can any cutting-edge research simulation one might do in chemistry. Having said all of that, I actually tend to find enzyme & gene regulatory mechanisms to be quite beautiful, which I suppose might be a place where we have an example within the biological sciences but is written in the language of chemistry. For example, glutamine synthetase is responsive to multiple feedback inhibitors (and will only more-or-less fully shut down in the presence of all of them) or can be covalently modified. For those who speak the language, organic synthesis also has its moments of almost mathematical beauty, sparkling with economy, elegance, and yes, sometimes, even surprising universality. The first time I saw a Diels-Alder cascade reaction to form 4 six membered rings of determined stereospecificity from a single chain, I was awestruck. MJ: I agree that enzyme mechanisms constitute one of the few widely recognized aspects of beauty in chemistry. I do agree that the practical implementation of equations in physics might be messy. But for some reason physicists have always claimed notions of mathematical beauty as much as mathematicians themselves. The Dirac equation may be beautiful, but try applying it the simplest of laboratory situations. Anon: Amen, I felt the same way when I first encountered carbocation-based reaction cascades in steroid synthesis (pioneered by William Johnson). I just want to share something - last week some post-docs and I came up with some beautiful electronic structure theory from the data we were working with, and it would have really impacted the field of thermoelectrics. Unfortunately, upon closer inspection, our theory was wrong ... the more refined data did not support our hypotheses. "whenever he had to choose between truth and beauty in his works, he usually chose beauty." You ALWAYS choose truth. There is NO reason the world has to be beautiful. The world is, however, TRUE. As a scientist or mathematician, it is your duty to communicate what is true, not what is beautiful. It does not take some dramatic hubris to believe that Nature is more powerful than what your human brain considers beautiful. That being said, oftentimes, while a wrong, beautiful theory can be seductive - digging deeper often reveals more intricacies and subtleties of nature, true subtleties, that are far more beautiful than the 'wrong' things. Looking at proteins in the protein data bank can indeed be beautiful, until, oh-well, you are following the trace of a polypeptide in an alpha helix or loop and it suddenly stops-the side walk ends; no electron density-ah, but it starts again in 20 angstroms or so. Why, pray, tell? Answer: disorder! Everyone knows that many proteins are intrinsically disordered, and it seems that a proteome's disorder increases with the complexity of the organism. And as far as mechanisms go, everyone knows that you never prove a mechanism perfectly; you only disprove a mechanism. Most of published science is junk; people paint pretty pictures. The Ptolmeic model of the universe and the spontaneous generation theory of the origin of life were so beautiful and simple! And wrong. And what about poop, for God's sake? Is that beautiful? A breathtakingly beautiful essay, in itself. I share your wonder and awe in looking at denizens of the Protein Database. One is looking at exquisitely engineered molecular machines, and even more-back into 'Deep Time', at structures (and the DNA codes which represent them) which have been conserved for hundreds of millions of years. The Protein Database to me is the ultimate manifestation of pantheism-seeing God in nature.